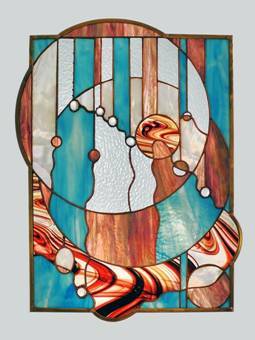 The Trinity panel measures 18" x 26" and is made of Blenko glass and rondels. The Starfire crystal bevels were made by Dennis Swan. 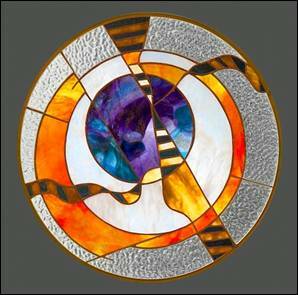 There are a few marbles scattered in the panel to concentrate light. The copper foil method was used to make this panel. 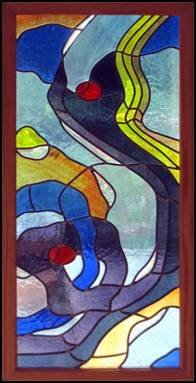 The panel is in the artist's private collection. 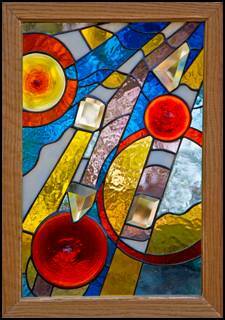 A Little Bit of Bling measures 18" x 24" and is made of mixed glasses. There are glass marble inclusions to concentrate light in the center of the panel. 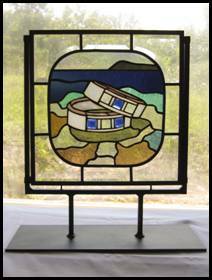 The unusually shaped panel is framed in hand bent brass. Please contact the artist for purchase. 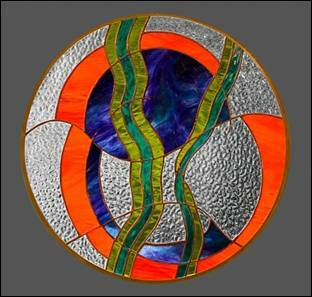 Incomplete Forms is an 18" round panel made with Youghiogheny and Wissmach Glass. Construction was by copper foil method. Please contact the artist to purchase. Interrupted Forms is an 18" round panel made with mixed glass. Construction was by the copper foil method. 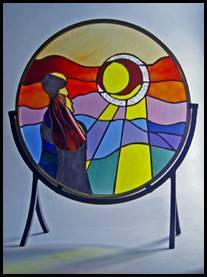 Fallen Angels measures 12" x 18"
( not including the oak frame) and is made with Blenko Glass and rondels. Illusion bevels were made by Dennis Swan. 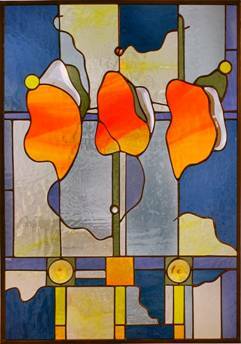 Deep Reflections Leaded glass panel made with Blenko glass and rondels. Starfire crystal bevels by Dennis Swan. 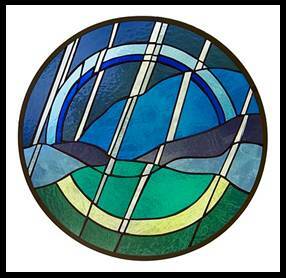 Frame is oak 19" x 39"
Thunderstorm on Keeney Mountain made with Blenko Glass. This hanging can be ordered in most sizes. Please contact the artist. 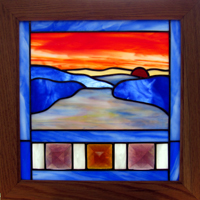 Mountain Landscape is a copper foiled landscape that can be made with a variety of glasses and colors. This is one example of the popular design. Contact the artist to order. Poseidon's Chalice is a free standing sculpture made with marbles and rondels and iridescent glass. Mounted on a marble stand. Private Collection. 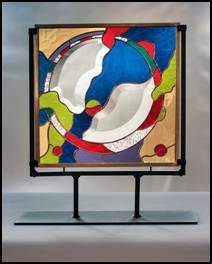 Arctic Currents is an autonomous stained glass panel made with Blenko glass. 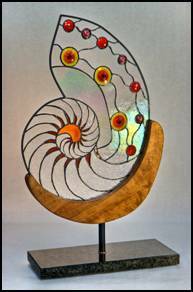 Starfire crystal bevels by Dennis Swan.. 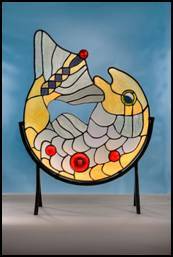 The Salmon of Wisdom is a free standing panel with mixed glasses and Blenko rondels and jewels. The Salmon of Wisdom comes from Irish mythology. The salmon is the symbol of life and rebirth as it lives in the sacred rivers and returns to the place of its birth to regenerate by creating new life. The Salmon obtained wisdom by living in a sacred well, where the hazel nut Tree of Knowledge grew. When the nuts (kernels of knowledge) fell from the tree and into the well, the Salmon ate them. The Salmon ate seven nuts from the tree of knowledge and became very wise. Legend tells us that the Salmon selects certain individuals to receive this knowledge by allowing itself to be caught and eaten. Early illustrations of this “Sacred Salmon” appear in the Book of Kells. My Salmon of Wisdom is shown meditating on and ingesting the bright hazelnuts. His tail has a Celtic knot to reveal his ancient history. Song of the Sparrow depicts a sparrow's life with egg, feather, sun, moon, earth and a life in the trees with sky and clouds. Contact the artist to purchase. No work or photographs may be reproduced without permission.